The 1999-2000 storm season so far has been a frustrating one. Some regions such as the North West slopes have had a bumper year, but it has been a poor season in others such as coastal New South Wales, particularly my home territory - the Illawarra coast just south of Sydney. 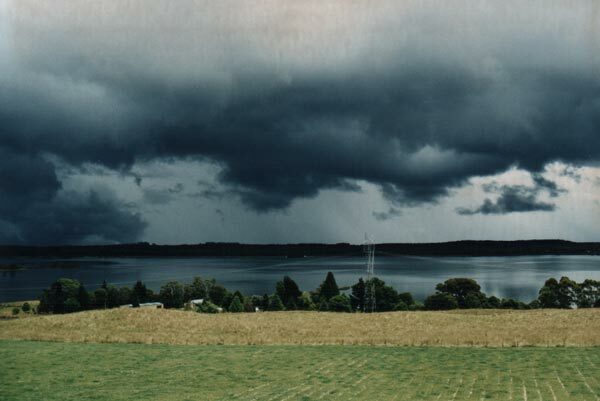 I have trouble recalling the last nighttime storm, that is how bad it has been. 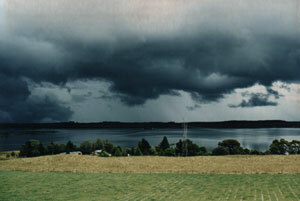 The forecast for the 28th was for rain with the chance of thunderstorms. Moisture was dripping through every level of the atmosphere, not exactly a good a great setup, the previous day was middle layer cloud heaven and today was shaping up similar with middle layer clouds and hazy skies. However around 11am the sun broke out across areas of the Illawarra, Sydney and the Blue Mountains. The atmosphere was that primed that it took only 30 mins for several storms the form, in fact at one stage there was perhaps at least ten cells I could chase. Whilst all this sounds great it is not normally the recipe for severe storms, too much middle layer moisture, no cap and limited heating. 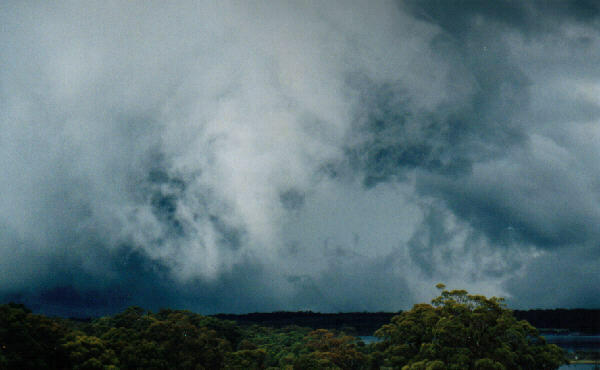 Around midday I decided to chase as a cell west of Nowra was persisting with heavy rainfall indicated by radar. I targeted the Nowra area assuming the cell would drift eastwards. When I reached the Princes Hwy the holiday traffic heading for the coast was bumper to bumper, I quickly decided that Nowra was no longer a viable target. Between breaks in the low cloud I caught glimpses of some nice storm cells over the southern highlands, this became my new target area. I headed for Jamberoo Pass and the small town of Robertson. The top of Jamberoo Pass was clothed in thick fog, there would be no problem with dew points today. As usual the fog broke with a few minutes and kilometres from the escarpment edge. To the south west was some of the darkest blue base I have ever seen. 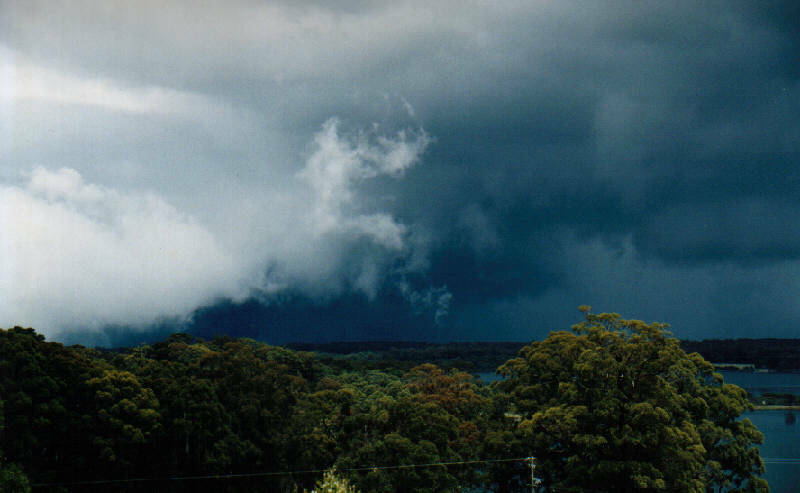 Not your hail-wallcloud type dark base, but a ragged disoganised humid one that promised only heavy rain. Vivid white tags of cloud contrasted against inky base to give lovely photos. But I stress that it was the product of the land geography as much as the storm. With close to 100% humidity and cliff escarpments everywhere the slightest turbulence condenses into cloud, so don't read too much into it. There are limited viewing areas near Robertson, one of the better for south west - west views is to take the Wildes Meadow turnoff just after Robertson, about 10kms along this road near Fitzroy Dam you get a superb view. I pulled over here and took some photos. Looking at the storm it became evident that the earlier cell had was now forming a squall line and moving more NE than E. I had no choice but to let it overtake me. There was approx 20 mins of very heavy rain. I returned home to steady rain from old anvils - a typical Illawarra coast scenario. 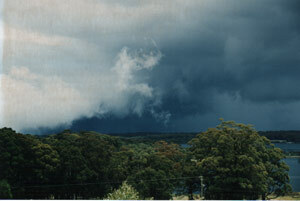 Later that afternoon more severe and larger storms developed in the Hunter Valley. Thunderstorms are already occurring in parts of the advice area and are forecast to continue this afternoon and evening. Some of these are expected to be severe bringing very heavy rainfall and possible destructive wind gusts.